The days when gold was the only show playing at the NSW mining theatre were well and truly gone by 1879. Yes it still stood as the feature act on the new Mining Department’s annual report, but other mineral and energy ventures were also very much focus of operational interests. 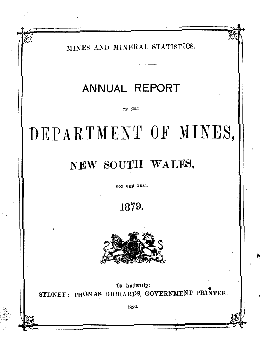 As the introduction to the report noted …”The efforts made during the past year to collate and disseminate full and correct information respecting new discoveries, as well as to furnish reliable information concerning mineral lands available for occupation for mining purposes, have been persistent, both in the head office and in the offices throughout the country. While traces of gold had been found in NSW prior to 1851, it was the discovery of the precious metal in payable quantities at Summerhill Creek near Bathurst that turned the future course of the NSW colony on its head. From the Reports of the Wardens and Mining Registrars it appears that at Trunkey there is a good opening for miners who understand the working of quartz-reefs. They can earn £2 lOs. and upwards per week, and there is work for at least 200. Alluvial mining is retarded by want of water; there is ground in several localities that would pay well with water. Two men are said to have 130 ounces of gold as the result offour weeks’ work on the banks of the Abercrombie River. At Tuena quartz-mining is at a stand for want of machinery, while at Junction Point and Victoria Flat where there is machinery this branch of mining is improving. At Orange prospects are said to be improving. In the Northern Division there are said to be immense deposits of auriferous quartz on both sides of the Belubula River, the stone though poor is soft and easily crushed, arnd will pay good wages, worked on a large scale with water-power. At Rockley there are said to be considerable areas that would pay for sluicing if a supply of water were brought on to the field. During a period of five weeks, while water was available, one miner, with the aid of two Chinese, obtained, by sluicing, 53 ounces of gold. In the Mudgee District the “Varden reports an increased yeild of gold and improved prospects, due to the introduction of additional appliances and to co-operation becoming better understood, and to the ground being in consequence more effectively worked. In the Lachlan District the Warden reports that prospecting new country has been prevented to a great extent by want of water, but both alluvial and vein deposits have been discovered by the few parties who have been searching. He thinks the country between the Lachlan and Darling, and the Murrumbidgee and Bogan, will be found to be rich in gold, copper, and tin, and wiil be the site of vast mining operations as soon as water and capital can be brought to bear upon it. He states that the prospects of alluvial mining are more encouraging than at any time during the past three years. In the Southern District the Warden reports a better supply of water than for many years past, which proved beneficial to the operations generally of the miners; but the miners at Araluen were flooded, and the works so much damaged that the yield of gold from that quarter has been seriously affected. Work has been stopped at the Major’s Creek reefs, owing to the inability of the miners there to treat the mundic and pyritous stone satisfactorily. The stone has been tested on a large scale in Victoria, and found to contain sufficient gold to pay for working, but the cost of sending it to Victoria eats up all the profit, and it cannot be effectively treated by any process known in this Colony. Works on the same principle as some in Victoria are to be erected, and it is hoped they will deal effectively with the stone and enable these reefs to be worked profitably. From Little River the Mining Registrar furnishes a list of nuggets found in 1879, varying from 19 dwts. to 32 ozs. 15 dwts., also a list of those found in that division from 1856 to 1878 ; these nuggets are said to haye been spread over an area of 30 square miles. Satisfactory yields have been obtained from the reefs at Yalwal Creek, and it is thought these reefs deserve more attention than has hitherto been giren to them. Skill and appliances are both required. The results obtained at the Dromedary are encouraging. From Little River the Mining Registrar furnishes a list of nuggets found in 1879, varying from 19 dwts. to 32 ozs. 15 dwts., also a list of those found in that division from 1856 to 1878 ; these nuggets are said to haye been spread over an area of 30 square miles. Satisfactory yields have been obtained from the reefs at Yalwal Creek, and it is thought these reefs deserve more attention than has hitherto been giren to them. Skill and appliances are both required. The results obtained at the Dromedary are encouraging. In the Tumut and Adelong District, at Tumbarumba, there is said to· have been less rain in 1879 than in 1878, and consequently sluicing operations have been suspended, except during short periods. There is promise of improved machinery at Ournie, which will treat both quartz and pyrites effectively. The prospecting works at Paddy’s River, aided out of the Prospecting Vote, are said to be progressing satisfactorily. At Albury several claims have been taken up, and some stone raised, but none crushed during the year. In the Gundagai Division a good deal of prospecting has been carried on, chiefly at Nimo Ranges and Jones’s Creek. The discovery of gold in connection with asbestos is being followed up, but some difficulty is experienced in extracting it. In the Peel and “Grafton District prospects are said to be brighter at Nundle, and also at Bingera, where it is said there was an increased yield of gold. In the Glen Innes Division good prospects were obtained from the newly discovered reefs, but there was no machinery to crush the stone. In the New England and Clarence District the reefs at Lunatic were improving, but there was only one small battery, and crushing was delayed for want of water. A ton of stone from the Perseverance Reef, sent to Sydney to be crushed, yielded 50 ozs., and the Lunatic Reef, 1 foot wide, is said to average 4 ozs. per ton. The tunnel for the hydraulic sluicing at Poverty Point has yet to be cut through about five chains of hard rock. Auriferous ground was discoycred between Timbarra and Fairfield. In the Hunter and Macleay District a battery was erected at Coolongolook, but the results obtained from it were not satisfactory; it is supposed the plant is defective. From several small parcels of stone sent to the Mint from different mines, the yield varies from 3 ozs. to 14 ozs. per ton. The reefs so far as tested are small, but few have been tested below 30 feet, and none below 70 feet. At Cobark some of the reefs are said to be as much as 7 feet wide, and they average from 2 to 3 feet, and the yield of gold is estimated at from 1 oz. to 2 ozS. per ton. There is said to be a large extent of similar ground still unprospected, in consequence of its being so mountainous and covered by a dense scrub which renders the procuring of provisions very difficult. At Rawdon Vale very little of the country has been prospected, bnt it is proposed to erect machinery there, and then no doubt the reefs will be tested. At Bumeal Creek the miners are waiting for machinery to be erected at Cobark. At Little River, 20 miles from Dungog, the reefs are promising, but there is no machinery, though water is available for motive-power. At Copeland there are three batteries, one of ten stamps, near the Centennial Reef; one of 10 stamps, on the Right-hand Branch; and one of 10 stamps, at the Rainbow; there is also a battery at the Bowman, but it is idle, being out of repair. The Government had attempted to breathe new life back into gold mining through both subisdies to encourage companies to prospect new ground at deep mining levels below 800 feet and also for the discovery of new surface goldfields. These initiatives had met with but limited success. Though the reward offered by the Government for the discovery of payable quartz veins below a given depth has not had the effect of inducing miners to engage in deep mining, in many districts it has however acted as a spur to one or two enterprising Companies. These are those at Adelong and Hill End, who are persevering in their praiseworthy efforts to test the value of our veins in depth. In addition to the prospecting works towards which aid was granted out of the sum of £5,000 voted in 1878, and some of which are still progressing, two parties of prospectors have been subsidised with a view to o!lellmg’ up entirely new country. One party have proceeded to the Danbury and Dale Ranges, in the Albert Dis~rict, Bome 50 miles west of Wilealinia j the other to an unexplored tract of country on the Cotter River, in the county of Cowley. The latter party report having discovered traces of gold on the banks of the Cotter River, but they have not yet found it in payable quantities; they have, however, commenced operations so recently that they have not yet had time to do more than commence their explorations. The party sent to the Albert District have barely reached the scene of operations. Some of the works aided out of the Vote upon the recommendation of the ~rospecting Board, have been completed without gold in payable quantities having been found; iudeed up to the present time in only two instances have the works so aided resulted successfully, and in these two cases it is not yet known what effect the discoveries will have in opening up new fields for mining operations. But almost as a last hurrah – a final moment in the spotlight before gold mining became just another mineral in the state’s mining pantheon – the departmental annual report took time out reflect on just how significant an item gold had been since its debut in 1851. The mineral which has more than any other contributed to the rapid progress in wealth and population of the Australian Colonies is gold. But for the discovery of this metal it is scarcely conceivable what period of time must have elapsed before the popUlation would have reached its present numbers. At the eud of 1850, when the territories now known as Victoria and Queenslaud were included in the Colony of New South Wales, the popUlation numbered 265,503; the imports for that year were valued at £2,078,338, and the exports at £2,399,580; while in 1857 the population had increased to 768,622, the imports to £23,985,617, and the exports to £19,091,464. Thus during the first seven years from the discovery of gold the population had increased 189 per cent., the imports 1,054 per cent., and the exports 695 per cent., whereas during the preceding seven years the population had increased only 60 per cent., the imports only 34 per cent., and the exports only 104 per cent. That this discovery should have contributed so largely to the progress of these Colonies is not surprising, when it is remembered that within the former limits of New South Wales more than 60,000,000 ounces of gold, valued at upwards of £240,000,000 sterling (equal according to the figures supplied by Mr. Del Mar, M.E., in his History of the Precious Metals, to more than one-third of the gold supply of the whole world during the twentyeight years 1851 to 1878) has been raised already. Taking the figures supplied by Mr. Del Mar in his Table of Gold Productions from 1800 to 1876, it appears that the produetion prior to 1847 did not in any year. exceed £6,000,000; whereas in 1848, the year of the discovery of the rich placers inCaliforniaProper, the production reached £13,500,000; and in 1851, the year in which gold was discovered in Australia, the production amounted to £24,000,000; and in the following year (1852) the production equalled 38,750,000 sterling. According to Mr. Del Mar’s estimate the total gold and silver in the world up to 1878 amounts to £2,661,200,000. The gold alone represents about £1,284,000,000, consequently the production of gold within the original boundaries of New South Wales equals about one-fifth of all the gold in the world. Professor Egleston, in a recent lecture on gold, at the School or Mines or Columbia Conege, is reported (Vide Town and Country J oumal) to have said that all the gold in the world would make a pile only 25 feet wide, 45 feet long, and 25 reet high, the contents of which would be 28,125 cubic feet. The pyramid at our International Exhibition representing the gold production of the Australian Colonies contains 4,180~ cubic reet. Therefore, according to Professor Egleston’s estimate, these Colonies have produced rather more than one-seventh of all the gold in the world. Seeing that the writer’s intention is to include in the yield for Australia that of New Zealand and Tasmania, his estimate is considerably below the mark, but he has in fact given a total which represents the aggregate production of New South Wales, Victoria, and Queensland, and thus it will be seen that the production of gold from the territories formerly comprised in the Colony or New South Wales exceeds that of any of the great gold-fields or the modern world. The gold-fields, which in the past have proved so valuable in attracting population, might, notwithstanding the fact that gold-mining has lost the charm which in the early days surrounded it, still prove most valuable as affording an outlet for any surplus labour that may be attracted to our shores, if new arrivals could be induced to try their fortunes on them. For it can scarcely be denied that our gold-fields should, and under proper conditions would, afford employment to an almost unlimited number of labourers, but as a rule the uncertainty of the remuneration for labour performed by the miner on his own account operates as a deterrent, and many prefer remaining idle, in the hope of obtaining employment in the motropolis on wages, to the risk of engaging in work which may bring no reward. It competen~e, or even wealth, and attained a position they could not under ordinary circumstances have hoped to reach in· almost any other vocation. Then again, the independence enjoyed by the gold-miner, who is his own master, has a charm which compensates for much of the privation and disappointment inseparable from the gold-digger’s lot, and sweetens labour often ill-requited. Moreover, the gold-miner can as a rule live at a comparatively small cost; his wants are few compared with those of operatives in large towns, and many of the wants can be supplied by his own industry. For example, a gold-miner, in virtue of his miner’s right, which costs only lOs. per year, is entitled (in addition to mining for gold) to occupy and enclose a small area of land for the purpose of residence. Upon this he can build his house, the materials for which he can in most places have for the mere trouble of getting, and if he wish to remove to some other locality he has the right to sell and transfer his interest in the house and land so enclosed, or he can remove his house if he so desire. Upon the small plot of ground enclosed he can grow sufficient vegetables, &c., for his own use, and usually can obtain free of cost wood and water, as well as free grass for a limited number of cattle. Many of our gold-miners indeed combine farming on a small scale with mining, and gradually abandon the latter for the former calling. Doubtless many persons are deterred from engaging in gold-mining from a sense of inexperience, believing that experience is essential to success, whereas it frequently happens that a man without any previous knowledge of the work succeeds where experienced miners have failed. On many of our gold-fields any able-bodied man used to out-door work can obtain a subsistence by re-working old ground. For this work the most ordinary appliances suffice, and a few weeks’ experience enables him to acquire the local knowledge to guide him to the most suitable patches of ground, and the knowledge how to work to advantage. In the early days all our gold-miners were entirely void of experience, yet they not only discovered, but opened up, and to a great extent worked our gold-fields, many of them acquiring fortunes. What then the prospects of gold in the decades to come? What future did the imminent start of the 1880s decade hold for gold mining in NSW? As evidence of the extent of this field of labour we have in this Colony at least 22,000,000 of acres of auriferous land, and we have about 8,000 gold-miners; a large proportion of these engage in other pursuits ‘during a great part of the year, and it is doubtful whether 5,000 are constantly engaged in mining for gold, a number totally inadequate to the proper development of this important branch of our mineral wealth. The decline of our gold yield during late years has been regarded by some as evidence of exhaustion of our auriferous deposits, but when we consider how small is the area opened, compared with the area unexplored, and how far are even the oldest of our gold-fields from being worked out, we may safely conclude that the falling off in the yield of gold is due to causes other than exhaustion. The gradual exhaustion of such of the deposits within the older gold-fields as are within the reach of the miner unaided by capital. (d.) The want of capital, appliances, and skill, to work systematically and economically those deposits which cannot be profitably worked without their aid. When gold was first discovered (or rather when the .discovery was first made known) the excitement was naturally very great, and the desire to grow suddenly rich inspired a large number of persons who possessed no qualifications for prosecuting the search for the precious metal but a spirit of enterprise, and consequently the discovery of our gold-fields .was as a rule made hap-hazard; and there is no reason to doubt that others equally rich, or richer, yet remain to be discovered in the vast tracts of country still unexplored, and that numerous deposits passed over by our earlier explorers will yet be found, even in the most extensively worked of our oldest gold-fields. Recent discoveries amply support this view. One peculiarity of gold-mining is that the greater the number of persons engaged in the pursuit the greater is each man’s chance of success, and the smaller the number the less attraction has gold-mining for persons who have no employment or are following other callings. To fully understand this peculiarity, it must be remembered that gold has a fixed value and a ready market at all times, without reference to the quantity raised, consequently there is no such thing as competition and underselling. Again, each man’s labonr may result in a new discovery, in which numbers of others are free to participate. For example, A discovers a deposit of gold in a certain place, perhaps where gold had not previously been worked, but the deposit is not rich; however others are attracted to the spot by the discovery. They set in to work, and the result may be the opening up of a deposit or deposits so much richer than that first discovered that the original discoverer abandons his claim in order to participate in the richer discoveries of those who were first attracted by his find-thus proving the advantage of numbers; for had A been left to enjoy alone the fruits of his discovery, it is highly probable no further deposits would have been opened, and the locality might after a time have been abandoned as worthless, until by chance some other miner should be tempted to make a further test of the place. The want of means to carryon prospecting operations for the discovery of new goldfields, and the gradual exhaustion of those easily worked deposits of our known gold-fields, have been the main Cll,;uses of the decrease in the number of our gold-miners, and until new fields be opened, ‘or the necessary capital and skill for working the deeper or more difficult deposits of our older gold-fields be forthcoming, an increase of our gold yield can scarcely be expected. The working of these deposits is merely a question of time, because sooner or later the fact must become patent that under proper management these deposits present an opening for the legitimate investment of capital, and offer as great security and as certain a return as the soundest mining ventures of any other kind. The secret of the failure of some of the most important of our gold-mining enterprises is that when gold was reached so much as was readily obtainable was rushed out of the mine, and the proceeds were d.ivided, leaving no reserve for further explorations. Had part of the gold obtained been devoted to exploring the mine, and haa these works been carried forward simultaneously with the work of extracting the auriferous earth in view, the strong probability, almost certainty, is that a constant supply of auriferous material’would have been kept up for years, and moderate dividends would have been paid over a long period, instead of very large dividends for a limited period, and then the abandonment of the mine before it had been thoroughly tested . I regret to say that instead of an increased yield of gold in 1879, as anticipated, the returns, kindly furnished by the Deputy Master of the Mint and the Collector of Customs respectively, show a decrease upon the yield of 1878 equal to 10,015’84 ozs. These returns, in the absence of complete and reliable information direct from the mines, supply the most accurate information available, and therefore we must continue to rely upon them; but in view of the fact that while the quantity sent to the Mint in 1879 is less than that sent in 1878 by only 448 ozs., the quautity passed through the Customs in 1878 exceeds that of 1879 by 9,567 OZS., one is naturally led to inquire whether the abolition of the export duty on gold can have influenced the records of the Custom House-that is to say, whether the record of the quantity :Xported is now as complete as it was when gold was subject to duty. The repeal of this duty on gold took effect on the 1st October last, and up to that date only 2,750 ozs. had been exported. So far the small quantity sent out of the Colony might be accounted for by assuming that a quantity had been kept back in anticipation of the repeal of the duty; and if that had been the case a comparatively large quantity would probably have been exported between that date and the end of the year; but, so fai’ as the records at the Cnstom House show, no gold, the produce of this Colony, has been sent out of the Colony since the the duty was repealed, and consequently we appear to have exported in 1879 £36,426 worth less gold than we exported in 1878. As regards the decrease in the quantity sent to the Mint for coinage, that might have been accounted for hy the repeal of the gold duty affording greater facilities for sending gold out of the Colony; but iI the records of the Custom House accurately represent the quantity exported, the public has not availed itself of the facilities thus afforded. The following table shows the quantity of gold won in the several districts, as returned by the Mining Registrars, compared with the quantities sent to the Mint, from which it will be seen that the quantities reported by the Mining Registrars exceeds the quantity sent to the Mint by 2,175 ozs. The returns furnished by the Mining Registrars, £01’ the year 1879, as compared with their returns for 1878, show an increased yield equal to 9,809 ounces; but this result cannot be accepted as evidence that a greater quantity of gold was won in 1879 than 1878, because these returns are, notwithstanding the praiseworthy efforts of the gold-fields’ officials, known to be incomplete, from the difficulty of reaching all the miners engaged in getting gold, and from the fact that in many places no returns can be obtained from miners working on private lands, or from Chinese. However, there is no reason to suppose that these returns err in the direction of exaggeration-they are simply incomplete. The following table shows the results obtaiued from the treatment of parcels of washdirt in various parts of the Colony, and though it is to be regretted that the results obtained in a much larger number of instances cannot be ascertained, owing to the miners not keeping any record of the quantity of material operated npon, the returns furnished show that the officers on the gold-fields have performed this part of their duty with commendable zeal. If the mines in this Colony were owned by incorporated companies, having a manager and other officers’whose duty it is to keep records and furnish returns, the collection of statistical information would be comparatively easy; but where the mines are, as a rule, owned by the miners who work them, no such records are necessary, and consequently are, in very few instances, kept; indeed were it not for the fact that many of them have to send their washdirt to public puddling machines to be operated upon they would have but a very vague idea how much earth had been washed during the year. The results obtained in 1879, so far as disclosed by the returns, compare favourably with those of 1878, the a\’erage yield being 3 dwts. 3’34 grs. per ton in 1879 as against· 2 dwts. 10’13 grs. per ton in 1878. The quantity of washdirt included in last year’s returns, however, is less than the quantity in the return for the preceding years by 1,825 tons. Unfortunately the returns from the Mudgee Dist~t furnish no particulars of the quantity of washdirt treated during the year, and the returns in respect to some of the principal claims at Araluen are in a like manner defective. 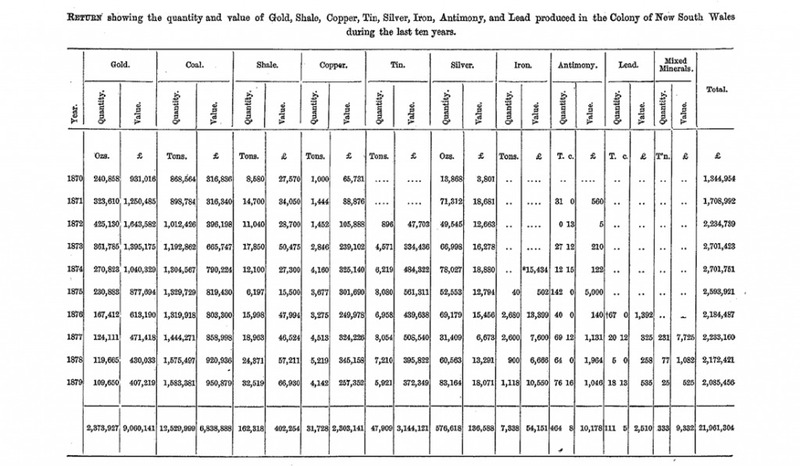 The following table shows the average yield per ton of certain parcels of quartz crushed in some of the districts :- The quantity of quartz treated, of which returns have been furnished, is not so large for 1879 as for 1878 by 9,536 tons, but the average is considerably higher, being 1 oz. 5 dwts. 7’81 grs. per ton for last year as compared with 19 dwts. 5’73 grs. per ton for the previous year. From the tables annexed to this report it will be seen that the number of miners on our gold-fields, including Chinese, is 8,102, and the quantity of gold won was 109,649 ozs., valued at £407,218 13s. 5d. The quantity of gold won divided amongst the above number of miners gives as the result of each man’s labour for the year 13 ozs.10 dwts. 16’11 grs., the money value of which is £50 5s. 2id. per man. This result is not, I feel satisfied, as satisfactory as would be obtained if the quantity of gold won and the number of miners actually employed upon our gold-fields throughout the year could be accurately ascertained. For example, many of the silver mines are held under the Gold-mining Regulations, because the lodes therein contain a certain quantity of gold, and thus the miners employed upon them are counted as gold-miners, and properly so, because they raise gold though the bulk of their earnings is from silver. As stated in a previous part of this report, I do not believe 5,000 miners were constantly engaged in gold-mining operations throughout the year, and I have no doubt that the quantity of gold won during the year exceeds that given above. However, in the absence of accurate returns those available must be accepted.